Scott Bennett belays a leader uses a GriGri while feeding a tag-line by hand. Skinny sport climbers know and love the Petzl GriGri. Though they smoke cigarettes and warm up on 5.13. They’re not interested in glacier climbs or multipitch ridge scrambles. 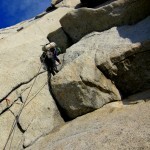 And the folks who do train for these routes often eschew the weight and singular purpose of such a heavy belay device. But that doesn’t mean that those of us who are interested in the mountains (and who don’t climb 5.13) shouldn’t embrace the GriGri as well. And with the new lighter version weighing the same as the Trango Cinch, climbers have a couple of excellent options for a belay device and all-around tool on long alpine routes. Sure the GriGri is heavy, and I’ll be the first person to confirm the importance of a lightweight kit for long routes. So if it’s only ever used as a belay device on an alpine route of just a few easy pitches, the GriGri’s weight makes it an unworthy substitute for a traditional tube-style device. But for climbers able to use the GriGri as a versatile tool with a myriad of backcountry possibilities, the GriGri is en excellent addition to one’s rope, rack, and standard alpine setup. Despite the Petzl GriGri 2 weighing 82 grams (or about 3 wiregates) more than a standard belay device, having one GriGri and one Reverso-style device is the ideal setup for a 2-person team on a long route. Both members can climb constantly belayed via mechanical-assist devices. Both climbers can suffer a lapse of attentiveness while their partners are always on secure belay, with the help of simple physics to lock off the rope should the belayer get injured. 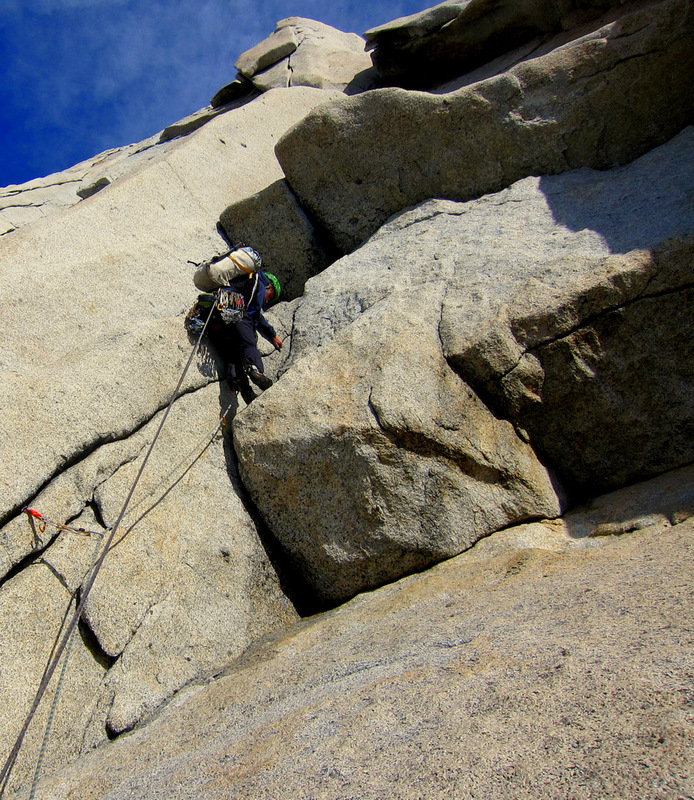 The leader climbs the pitch carrying the (lighter) Petzl Reverso, and is belayed on the GriGri. 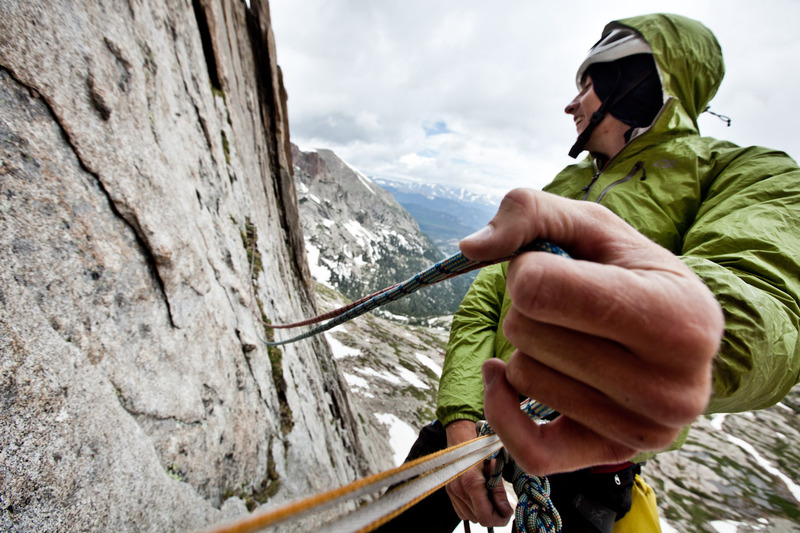 The follower is then belayed off the Reverso in “guide mode”, and can hang or fall with impunity, while the belayer changes clothes, eats, re-racks, and plans the next lead. This added belay safety is the first of several advantages to using a GriGri. Blake Herrington freeing a pitch on the West Pillar of Cerro Pollone, belayed with a GriGri on the 4th day out from town. 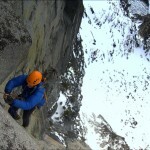 If the team decides to simulclimb on a pitch, the follower can vary the distance between climbers by using the GriGri as their “tie-in” and taking in or letting out rope as the speeds of the two climbers vary. At stances, the follower can instantly change to giving the leader a traditional belay, since the rope is already running through the auto-locking belay device. If following on easier ground than the leader is at, it’s a cinch to move faster and pull any slack through the device, quickly throwing loops over your shoulder to prevent tangle. And if the follower reaches a crux spot and wants a better belay, the leader can quickly put in a high piece of good gear and clip the rope to it, knowing that the follower’s GriGri means they’ll be able to climb while the leader rests at this piece, without collecting slack in the rope. 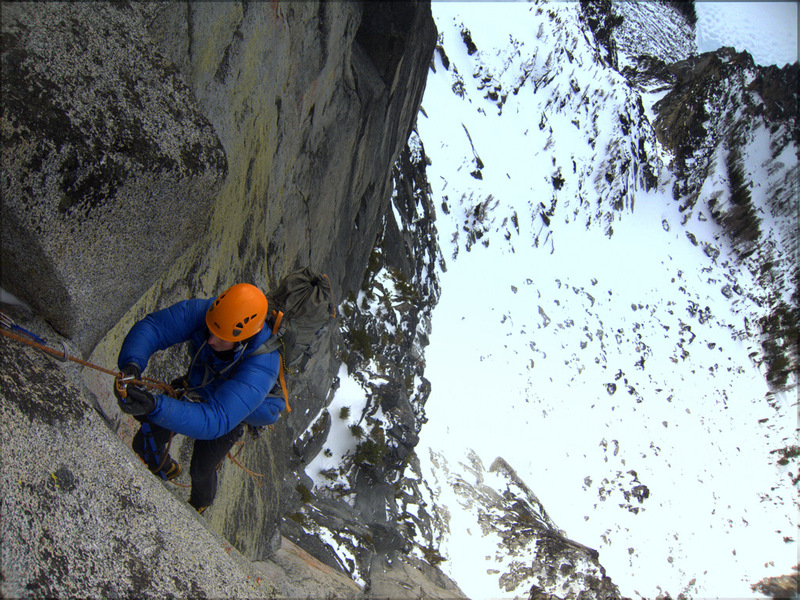 A storm-swept pillar of granite in Patagonia created a nightmare of rope-snagging terrain for my friend and I during an ascent in early 2011, but the GriGri again proved worth its weight. When our tag line (or lead line) would get wound around flakes or cracks and stop the leader mid-pitch, we were able to have the leader build a belay and tie off the stuck ropes. The follower would then self-belay up the pitch using the GriGri on this impromptu fixed line, until eventually able to reach and free any snarl of wind-blown cords. A similar technique (though by choice rather than last resort) is used when the leader short-fixes a rope and continues to climb while the second climber follows, with a GriGri used to self-belay. And for those routes where the follower is jugging on some terrain, using a single ascender (with etrier) and a GriGri (on the harness) makes for a simple jugging setup that doesn’t add much extra weight to the pack for a follower who switches to free climbing. And for glacier navigation and crevasse rescue, just maintaining a small bite of rope between your tie-in and the GriGri means that if the rope between climbers is weighted in the event of a crevasse plunge, you’ll already have some slack from which to begin ascending or hauling. And although rappels would seem to be the crux of this system, they actually present one of its greatest advantages. Nate Farr jugging the crux pitch of Colchuck Balanced Rock's West Face during the first winter ascent, using one Jumar, and one GriGri. With two climbers and two belay devices, but only one device capable of rappelling on both strands of rope, the GriGri user always rappels first. Simply thread the rope through the anchor like normal, but clip a keynose locking carabiner to the anchor as well, and clove hitch the rope to this. The first rappeler then descends on a fixed strand of the rope, and while rappelling on the GriGri, is able to let go of the brake hand at any point. This allows them to fix tangles, pull the rope out from flakes, manage skinny cords in the wind, find that next rap anchor in the dark, and complete all manner of dangerous tasks that are made safer without needing to keep your brake hand clamped down tight. Once you’ve straightened out the ropes and reached the next station, the second rappeler, using a two-slot device, simply unfixes the rope and rappels as normal on the cleaned-up rappel lines. I used the term Grigri to apply generally to devices that lock automatically on the rope and work as mechanical ascenders. The Petzl GriGri 2 (185 grams – $95) and the Trango Cinch (182g – $85 ) are the two best for this use. I also used the term Reverso to apply to any of the guide-style devices that can be hung from the anchor to belay–and automatically arrest the fall–of a seconding climber. These are produced by nearly every climbing hardware company, with slight variations in price, weight and ideal rope width being the only differences. 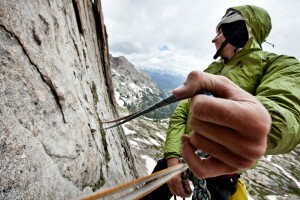 The official recommendation is to always keep a brake hand on the rope, even with a Cinch or GriGri. If you are leading a pitch with poor protection just off the anchor, tests have shown that the GriGri’s faster “catch” puts slightly more force on the protection, so in this case consider belaying the leader with the reverso. Obviously this system wont work for leading on twins or half ropes. In the rapping scenario with the GriGri mentioned at the end of the article, it might be possible to further simply if the second person (using the regular belay device) is pre-rigged for rappel. The first climber could rap on the backside of a single strand coming out of the pre-rigged device and that line should be fixed. -rap lines of widely varying diameter might mess with the system? It does seem that over the course of a many rappels that some time is saved pre-rigging since both folks rig for rappel at the same time instead of the regular way of doing it up. Cool article that made me rethink using such a tool in the alpine . . .